In 1929, after five difficult seasons, Russ Carrick stepped down as the head coach of the University at Buffalo football team. The 1929 season was characterized by the introduction of two complete squads – the Ponies (light-weight and fast) and the Bulls (the heavier squad). Each squad was carefully trained and coached and each had definite duties to perform. Ed Malanowicz, Earle Ridall and Bob Beyer were some of the star Buffalo players. Home: Rotary Field, Bailey and Winspear Avenues. “Heavy Forward Line Too Much for U.B. Team” Buffalo Courier-Express Buffalo, NY, 6 October 1929. “Cotton, Substitute Back, Leads Bulls to Brilliant Victory in Final Quarter” Buffalo Courier-Express Buffalo, NY, 13 October 1929. “Sensational Rally Enables Bisons to Defeat Clarkson” Buffalo Bee Student Newspaper Buffalo, NY, 25 October 1929. “U. B. Succumbs to Rochester After Stubborn Struggle” Buffalo Courier-Express Buffalo, NY, 27 October 1929. “Malanowicz and Smith in Scoring Mood, After First Half Weakens Opposition” Buffalo Courier-Express Buffalo, NY, 3 November 1929. “U.B., With Inspired Aerial Attack, Wins Final Home Game” Buffalo Courier-Express Buffalo, NY, 10 November 1929. “Malanowicz Stars With Run of 90 Yards to Tie Score, Then Adds Winning Marker”Buffalo Courier-Express Buffalo, NY, 17 November 1929. Last spring, five men pledged their best efforts to the improvement of Buffalo’s football ranking. Already the results are becoming apparent. Every afternoon for the past three weeks these men have been working to train and condition the squad for the rigorous schedule which it faces. These men are Head Coach Jay L. (Biffy) Lee, and associate coaches Knapp, Pritchard, Ailinger and Drumsta. Biffy Lee is well qualified to step into the position which Russ Carrick felt it necessary to resign. He began to play football in 1900 with Western High School of Bay City, Mich. Four years there and fours years with club teams prepared him to play with Albion College in 1908 and to him was assigned the quarterback position the mythical All-Michigan eleven. 1911 found him calling the signals for Notre Dame. In 1915, he acted as coach at Penn College, Iowa, and returned there in 1917 after spending a year as coach at Notre Dame. The war interrupted for a few years, but Lee returned to the game in 1922 as mentor for Cornell College, Iowa. From the official side of the game as well, Biffy is acquainted with the sport, as he was in great demand during the later years as official for Missouri Valley Conference and Big Ten games. James J. Ailinger, who started playing with Hutchinson High and was captain of the Bisons in 1923, will devote his time to the center and guards. 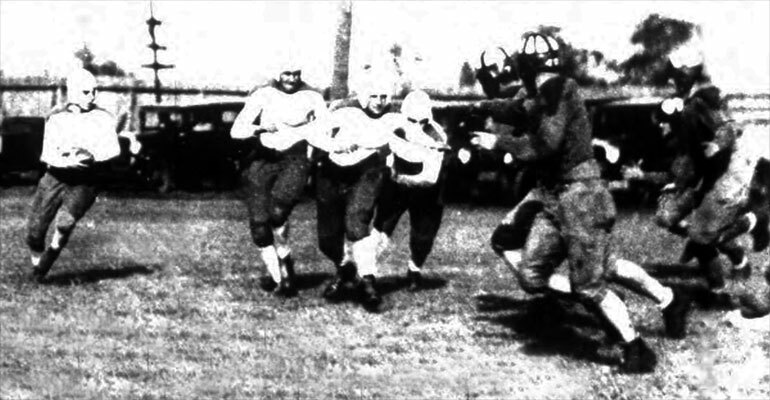 Stanley Drumstra, pilot of the 1928 team, has been assigned the tackles. Dr. Lester E. Knapp, captain in 1924, will team with William Pritchard in developing the backfield. Pritchard has a substantial record to recommend him, playing with South Park, Penn State, and the New York Yankees. Coach Lee will instruct the ends and generally supervise the entire eleven. 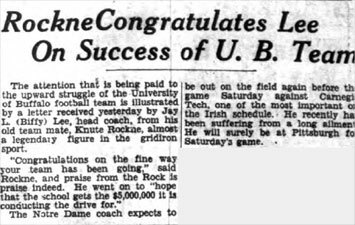 The attention that is being paid to the upward struggle of the University of Buffalo football team is illustrated by a letter received yesterday by Jay L. (Biffy) Lee, head coach, from his old team mate, Knute Rockne, almost a legendary figure in the gridiron sport. The Notre Dame coach expects to be out on the field again before the game Saturday against Carnegie Tech, one of the most important on the Irish schedule. He recently has been suffering from a long ailment. He will surely be at Pittsburgh for Saturday’s game.